(CHARLOTTE, NC) — Whenever the Library of America — the publisher that releases those elegant volumes with white, cursive writing on black covers — comes up with its next book of classic political oratory, we’ve got a pretty good idea of two speeches that won’t be included. After Mitt Romney gave a bland, workmanlike speech stating the case for change in Tampa last Thursday, President Obama followed it up with a glorified stump speech last night in Charlotte. Neither address will stand the test of time. Rather, they were statements of both party’s basic principles, setting up an election that is, in essence, Democratic base versus Republican base — and thus, a battle of turnout. Obama’s speech was mainly a laundry-list recitation of Democratic positions, stressing familiar themes about the role of government with nods to liberal positions on social issues. It’s been Obama’s standard message since 2008, when his lofty, post-partisan dreams helped to propel him into the White House. Just because Obama’s address inspired yawns among journalists, who have heard versions of it many times before, doesn’t mean that it was bad. The speech drew a dividing line with Republicans on issue after issue, not unreasonable considering the nation is deeply divided along hard partisan lines. On both sides, this election is one of us vs. them. That’s not pleasant, but it’s reality. The release of this morning’s jobs report — the unemployment rate decreased to 8.1% but only a weak 96,000 jobs were added — gives both sides something to spin. But the basic outline of the election remains unchanged: The president is not in a strong position, but he’s not doomed either. While he would love to see better jobs data, he has yet to pay a major political price for them. It is unclear whether he ever will. Reasonable people can disagree on who gave the best speeches at the two party conventions. It’s easier to get consensus on a different question though. Who had the most fun giving his or her speech? C’mon — it’s got to be the Big Dog. Former President Bill Clinton’s address was classic Clinton — filled with one poll-tested notion after the next, animated by colorful facial contortions and off-script insertions (“Are you listening in Michigan and Ohio and across the country?” Clinton asked, when talking about Romney’s opposition to the auto bailout). Clinton loved it not just because he loves politics and the grand stage, but also because he knew that Obama, who once downplayed his presidency, now needed him rather badly. Obama’s most notable criticism of Clinton during the 2008 primaries was that Clinton didn’t pass the test of history, that great presidents transform the country and its politics. And yet here was Clinton, boiling Obama’s presidency down to defensible, digestible little nuggets, just like Clinton liked to do in his own State of the Union addresses in the 1990s. Obama seemed to like Clinton’s style so much that he borrowed a bit of it for his own speech, but his style is dramatically different than Clinton’s — less specific and more inspirational. But eloquence doesn’t guarantee a real connection with the audience. Clinton’s performance as well as his support on the stump down the stretch comes with a big IOU. We have no idea whether Secretary of State Hillary Clinton will actually take the plunge again in 2016, but if she does, the current president would have a hard time standing in her way. Obama literally — as Joe Biden would say, folks — embraced Bill Clinton on the convention stage Wednesday night. In enlisting Bubba’s aid, Obama has figuratively embraced the Clintons fully, at long last. Perhaps he won’t actually endorse Hillary, but how could Obama back another Democratic presidential candidate without looking like a complete ingrate? Now that a week has passed since Mitt Romney’s convention, it seems he didn’t get much, if any, of a poll bounce, at least on the horserace. According to Gallup, Romney actually had a negative bounce — the race was 47% Romney, 46% Obama on Aug. 27, the first day of the Republican convention. By Tuesday — several days after the end of the RNC — Romney and Obama had flipped positions, 47% to 46% in favor of the incumbent (which is where it stood Thursday night as well). So at least according to Gallup, the convention didn’t move the horserace needle at all. But the evidence is contradictory. Romney’s convention appears to have improved his personal favorability ratings, for example; thus, the attempt to “warm him up” and let voters know him may have been partly successful. And Obama did drift down a bit in the all-poll averages. Since August 27, Obama has gone from a 1.1% lead in the RealClearPolitics average of polls to, as of last night, an exact tie. In sum, our guess is that Romney’s “bounce” might have been about a point. The immediate start of the Democratic National Convention coverage after the GOP left Tampa may have also contributed to the squashing of the bounce. About 30 million people watched Romney’s final-night speech, down from about 39 million for John McCain in 2008. (Obama’s ratings for his final night speech were not available as of Friday morning.) There’s some truth to the press banter coming out of Tampa and Charlotte the past two weeks that the party pep rallies are becoming largely irrelevant. Take the ratings: conservative favorite Fox News led all networks in viewership during the RNC but finished last on both Day One and Day Two of the DNC, and liberal favorite MSNBC soared during the Democratic conclave. That’s just one indicator that most of the people watching the conventions have been partisans, selectively cheering on their respective team. And compare the convention audience totals of 20-30 million each night to the likely total of voters in November, 130-140 million or so. The size of the convention audiences are about what you’d expect for the two party bases. Allowing for some overlap in the audiences (the political junkies out there), only about a third of general election voters watched much of either convention. If Obama also doesn’t get much of a bounce out of his convention, these will go down as two of the least impactful conventions in the modern era, along with 2004. In that year George W. Bush got a two-point bump out of his convention, and John Kerry got no bump (both according to Gallup). It’s possible that Obama and Romney, collectively, won’t even match that meager total. But this shouldn’t be surprising in a polarized era when there are few actual swing, undecided voters. It will take a week or two for the polls to settle down after the election. But given the lack of movement we’ve seen thus far during the two-week convention, it’s likely this will remain a close, competitive race. Convention coverage is so all-encompassing that it can overwhelm nearly everything else in the campaign world. But there are a few things that happened during the conventions that might have more impact on the outcome in November than all of the speeches delivered over the past two weeks. Last Friday, a federal judge in Ohio overruled a decision by the state legislature to end early voting on the Saturday, Sunday, and Monday before the Nov. 6 election. In 2008, 93,000 people voted on those three days before the election, and while of course those weren’t all votes for Obama, expanded early voting is more a priority for Democrats than Republicans. It’s impossible to precisely measure the impact, but if the decision stands (there is an appeal), the extra days of early voting are probably worth tens of thousands of net votes for President Obama. In Virginia, former Rep. Virgil Goode has apparently made the state’s presidential ballot. The Commonwealth’s procedures for getting on the ballot are only mildly friendlier to candidates than Augusta National was, until recently, to women trying to join the course. Candidates must collect 10,000 legitimate signatures, including at least 400 apiece from each of the Old Dominion’s 11 congressional districts. Republicans wanted to keep the Constitution Party nominee off the ballot because the conservative Democrat-turned Independent-turned Republican is likely to siphon more votes from Romney than Obama. Expect his total share of the vote in Virginia to be somewhere in the neighborhood of 1% or so. Our Geoffrey Skelley has more on Goode’s candidacy here. If Goode stays on the ballot, Romney will lose votes disproportionately to Goode, and those thousands could be critical if Virginia turns out to be very close. Finally, the federal Ninth Circuit Court of Appeals reversed a lower court’s decision to throw out the “none of the above” option that has historically appeared on the Nevada ballot. Provided the Supreme Court doesn’t intervene (quickly), this is another small setback for Republicans, because the GOP fears that voters who might not like President Obama could choose “none of the above” as a protest vote, rather than voting for Romney. Yes, these developments are minor, and they are not all necessarily set in stone. But in a very tight race, tiny shifts toward Obama in three of the Crystal Ball’s eight toss-up presidential states could matter in November. Tar Heel State boost from Charlotte convention? Last week in Tampa we dismissed the prospect of Republicans seeing any tangible electoral benefit from holding their convention in the Sunshine State. So what about North Carolina and the Democrats? Chart 1 examines electoral performance in states where Democrats have held their conventions since the end of World War II. The chart compares improvement (or decline) in presidential election performance based on the previous cycle’s election. If there was improvement, we looked to see if the outcome in the convention state showed greater gain than the national outcome, and if there was decline, we looked to see if the loss was smaller in the convention state. Note: Chart uses two-party vote (this eliminates all votes given to third-party candidates). 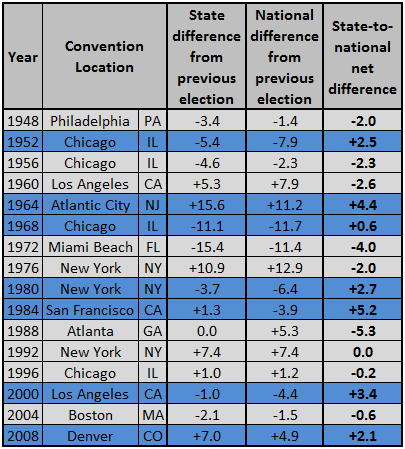 Years shaded in blue indicate when the Democratic presidential candidate performed better in the state where they held their convention than they did nationally compared to the previous presidential election; years listed in gray indicate where they did not. Since 1948, Democrats have performed better in their convention state in seven of 16 elections, but in half the cases, Democrats actually had comparably worse showings in their convention state than at the national level. (One other year was a tie.) So there is scant evidence showing that Democrats will gain electorally from their convention site. In the instances where Democrats performed better, other factors might have been in play. In 1952 Adlai Stevenson made his first run for president from the governor’s chair in Illinois, winning the nomination in Chicago. So really, Stevenson had a two-fold home-state convention advantage from having the convention in his home state as an elected official there. But it’s hard to say that the impact of the convention site outweighed Stevenson’s advantage as a home state governor. What makes it even harder to gauge is that in 1956, Stevenson was again nominated in Chicago as a native son. Yet his performance drop in Illinois was actually greater than his national dip that year. The 1968 election also shows just how little the convention site affects voting. Democratic performance fell sharply from 1964, but the numbers in Illinois didn’t fall off quite as much as they did nationally, despite the fact that the 1968 Democratic National Convention was a disaster of epic proportions. If there were any case where one would expect to see a greater decrease in performance in the state than nationally because of a convention, 1968 would be it. It’s possible that Democrats and Republicans are attempting to use their conventions as opportunities to boost voter registration and engagement in the areas around Charlotte and Tampa, as the Obama campaign did in Denver four years ago. However, the actual votes cast on Election Day 2008 didn’t really show a spike in turnout in the Denver area compared to the rest of the state. As Chart 2 shows, the entire state of Colorado saw a 12.3% increase in its total two-party vote from 2004 to 2008 (nationally, the increase was 6.9%). Denver and the immediate surrounding counties (Adams, Arapahoe and Jefferson) yielded a vote-total increase of 12.5% while the rest of the state increased 12.2%. That’s not to say that the convention didn’t help the Obama campaign’s efforts in Colorado. It’s just that if there was an effect related to the convention, it wasn’t dramatic. Moreover, even if Democrats tried to use the 2012 DNC as an opportunity to boost voter registration and contact efforts, it is questionable how much better President Obama could do in Charlotte. If we look at Mecklenburg County (which encompasses Charlotte), Obama increased the Democratic percentage there from Kerry’s 51.6% to 61.8% in 2008, a 10.2 percentage point jump, the second largest increase of any county in the state. It’s possible that Obama could do better than that in 2012, but if the general election is indeed as close nationally as we think it could be, it is hard to see Obama squeezing a higher share of the vote out of Mecklenburg County. Well, the verdict is in — and it’s obvious that the Democrats had the better convention. How do we know this? One word: Twitter. Last night, Obama’s address reportedly generated 52,757 tweets per minute, while Romney’s a week ago only generated 14,289. So much for the Democrats’ enthusiasm gap! In reality, the Twitter statistics are meaningless in projecting the actual election — by comparison, there were 10,000 tweets per second during the final three minutes of the Super Bowl. (Sorry, Twitterverse. We participate, too, but that doesn’t mean we collectively matter all that much.) So are the reports that the crowd at the Democratic convention was more “energized” than the one at the Republican gathering. Yes, it appeared to be true to us, and we were on the ground in both Tampa and Charlotte. But does the excitement level of 20,000 or so partisans in a convention hall predict much about November? Doubtful. Election-watchers are always inclined to look for some tiny signal in a close race that turns out to reveal the big picture. We want to identify the turning point in the election — not just before the historians figure it out, but before the election is over. But so far, there has been no revelatory turning point, nor some magic number of tweets, balloon drops (or in the case of the DNC, confetti), gaffes or polls that can tell us with finality what the outcome will be. We’ll keep looking, and keep you posted.